I think I’ve mentioned Mrs. Mom’s Magical Fanny Pack a time or two. It’s where Mrs. Mom stores everything we might need for a day at the parks. From aspirin to money to tickets to sunglasses, it seems like anything we could ever want or desire when we are prowling Walt Disney World is right there magically in Mrs. Mom’s Magical Fanny Pack. So, it was a real shock when the answer to the aspirin question was no, I can’t find any. What? No aspirin? What am I going to do? Please Magical Fanny Pack, don’t fail me now! But it did, and for that I banned it from the rest of the trip (but that’s a whole different story). Why did Mrs. Mom’s Magical Fanny Pack fail? That’s a good question, and I probably should admit that it’s my fault (isn’t everything). Why was it my fault? I got in a hurry and rushed Mrs. Mom (and we paid for it for 2 days). We arrived in Orlando at around 3 pm. Magical Express got us to the Pop Century around 5ish. We got checked in quickly and went to our room where we started talking about what to do for the evening. THE PLAN was a bit flexible for arrival day. (It usually is.) Option 1 was to go to Disney Springs and grab a bite at Earl of Sandwich and then get some dessert at Ghirardelli’s. Then we’d come back to the room and prepare for our big day at the Magic Kingdom (Mrs. Mom’s idea). Option 2 was to go to Epcot, eat our way around the world and see Starship starring Mickey Thomas at the Eat to the Beat Concert (my idea). We had discussed these options from the time we landed. Mrs. Mom really wanted to try the Earl of Sandwich, but I wanted to go to a park. 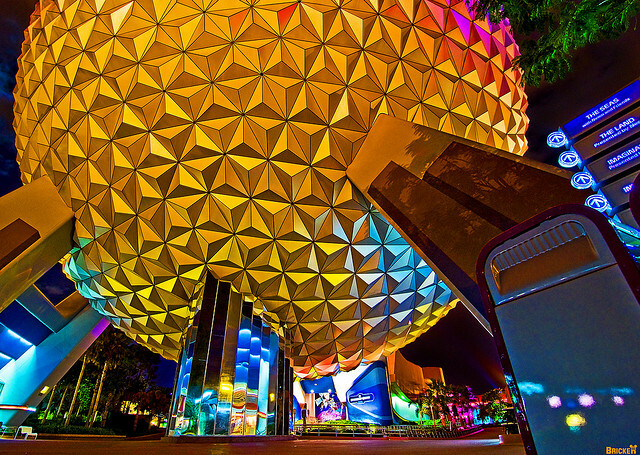 Do you realize how long it’s been since I’ve been in Epcot? (It was a really long time) I can’t wait any longer. I won’t say I threw a tantrum, but we ended up in Epcot. So what does this have to do with the Magical Fanny Pack failing? Everything. Mrs. Mom relented and we headed off for the bus. On the way to Epcot, I asked that fateful question, “do you have any aspirin?”, and the rest as they say is history. Stay tuned tomorrow (or the day after) for the continuing drama of the Red Notebook Chronicles. One of my favorite songs growing up was called “Feelin’ Groovy” (or the 59th Street Bridge song) . I can’t get it out of my head even now. Slow down you move to fast. So, if you want to feel “Groovy” on any trip to Disney World slow down and relax. Always remember, getting in a hurry can cause a headache. Literally. The second moral of the story is sometimes Mom knows best. The First Aid stations at all the Parks are excellent! Remember them in the future for any medical need! I have gotten Aspirin/Tylenol/Motrin, band aids, Pepto, ice packs, Ace Bandages a variety of creams and ointments and other items as well. I am one of those folks who enters the Parks without a bag (don’t want to miss a moment of fun). I keep the few items I need (room card, Annual Pass) on a lanyard and put my camera in a hoodie pocket. I rely on the generosity of WDW to give me relief from a headache or whatever else might ail me. I think of it as one of the few things that are free in The World. I know not everyone can be bag free, but, perhaps Mrs. Mom can leave out the meds and have room for something else. I’m counting the day till my next visit on May 4th…..hope not to have a headache but if I do, I’ll let Mickey and the Gang give me relief!